Observer Tree and surrounding forest declared World Heritage! Posted on June 24, 2013, in Uncategorized. Bookmark the permalink. 6 Comments. “THANK YOU! 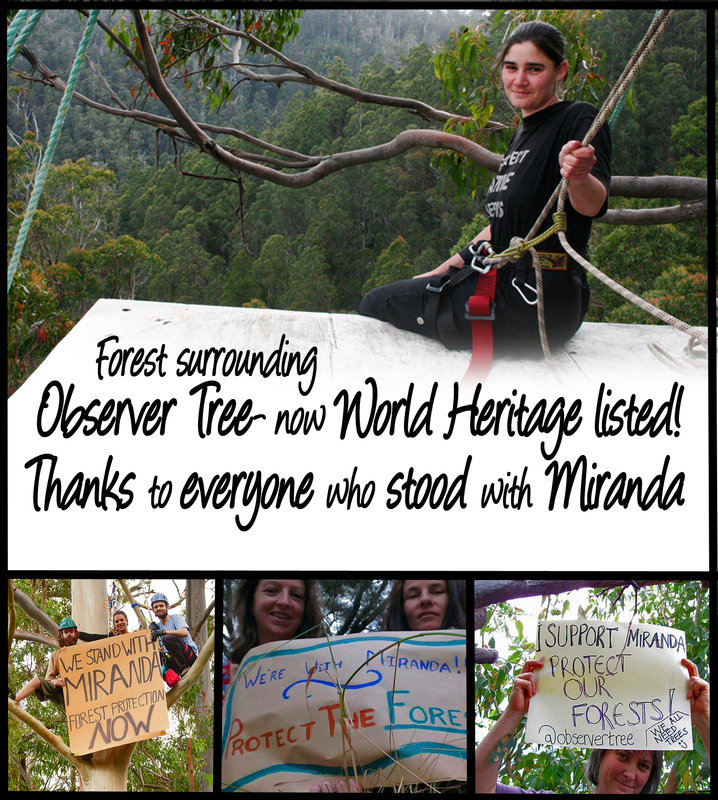 TO ALL THE OBSERVER TREE VOLUNTEERS WHO HELPED SUPPORT MIRANDA” thank you for believing in her, and for your support of her. We think you are an amazing group of people, and should be congratulated on all the effort you put in to save the forests for us all. BRAVO! Madeleine Kennedy Mt Evelyn Victoria. Thanks Miranda for your part in this great success ! Austra Maddox. Your’e a living legend. Celebrate! How could I forget to thank BOB BROWN for his decades of fighting for the forests, “THANK YOU BOB” Congratulations! It’s great news. Truly. However, the future is not easy. There are the TFA proposed reserves still in the balance. How do we achieve them?